Marvel Comics hosted a Women of Marvel panel at C2E2. The panel was moderated by Judy Stephens (Host & Producer of the Women of Marvel podcast). The panel included Tini Howard (writer, Thanos, Belit), Eve L. Ewing (writer, Ironheart and Marvel Team-Up), Jenny Frisson (cover artist) and Ashley Witter (cover artist). The Women of Marvel is a panel that started in San Diego last year, and became a podcast five years ago. Howard gave a brief explanation of her new Thanos series, “which answers the question ‘Why is Gamora?’” Ewing expressed excitement for the next issue of Ironheart. 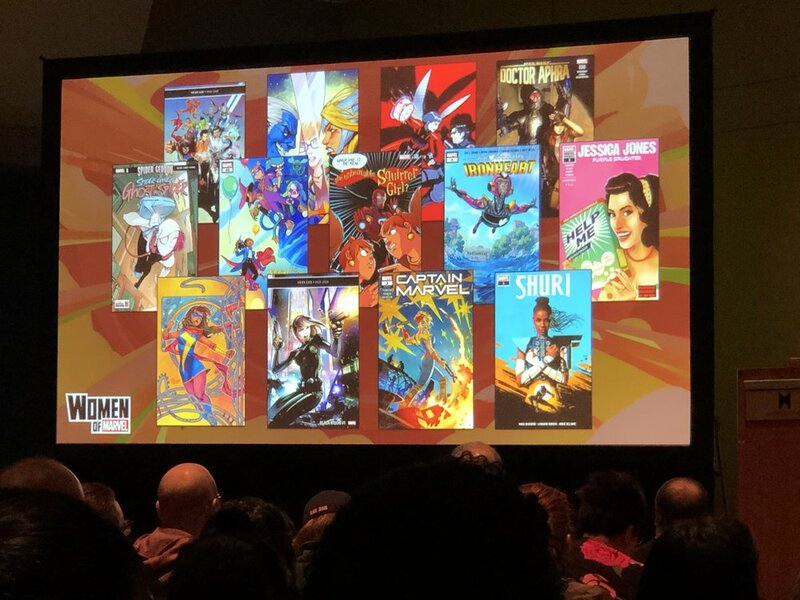 Stephens showed an image of some of the female-led Marvel titles currently being published and cheered that there are two many to put on one slide. She then asked all of the women and girls in the audience who wanted work in comics to stand a get applause, and assured them that there is a job for each of them somewhere in the community. “This is a community, and only we can support each other,” she said. 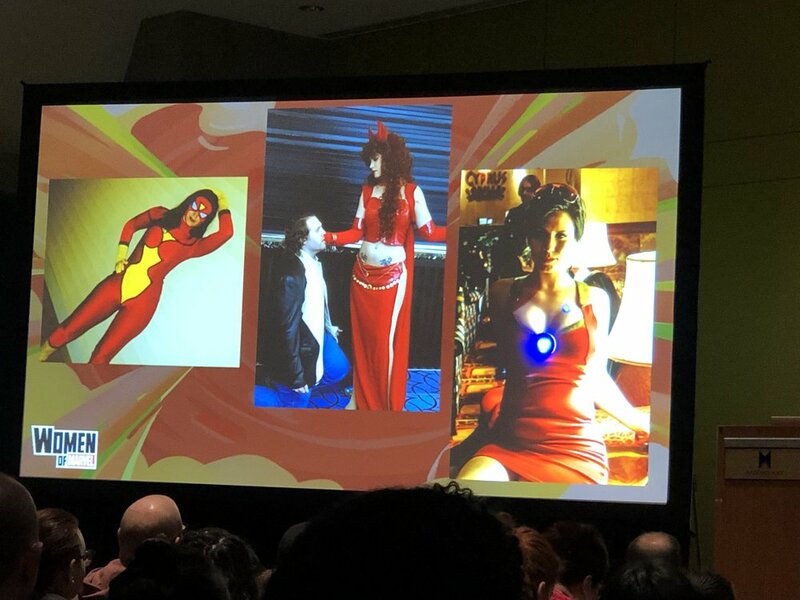 Stephens and Tini Howard discussed Howard’s past as a cosplayer, and showed a picture of her cosplaying as Spider-Woman, Scarlet Witch, and a gender-swapped Tony Stark. Howard was afraid when she broke into comics that people would find out what a nerd she was; Stephens makes the point that anyone can work in comics, and that someone in the audience could be cosplaying now and be working in for Marvel or their favorite company in ten years. 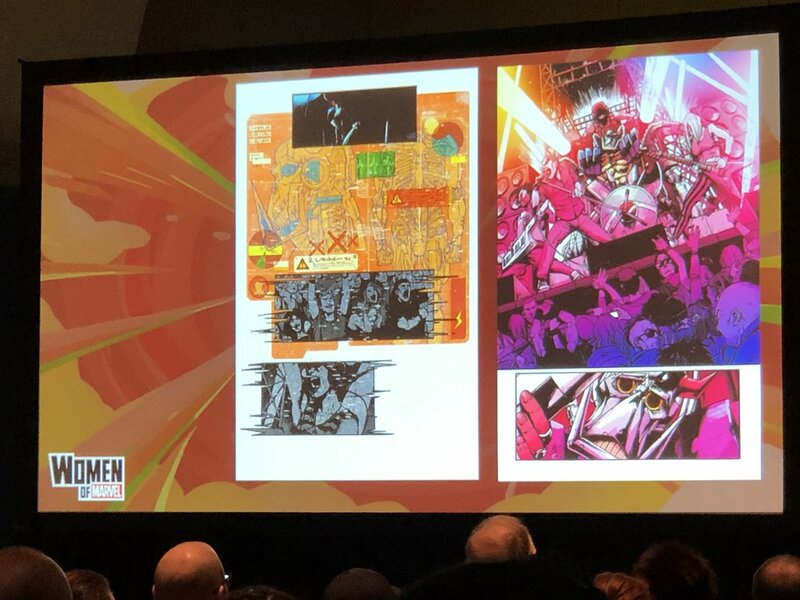 Stephens and Jenny Frisson discussed Frisson’s experience doing covers for the recently-concluded X-Men Red series. Each issue featured a different character from the book solo on the cover, as Frisson says, “feeling their feelings.” The fifth issue cover was a group image of all of the X-Men Red characters. Stephens then went on to discuss the “Marvel Rising: Heart of Iron” short that premieres April 3. This short will feature Ironheart/Riri Williams joining the team. The short will premiere on Marvel HQ’s YouTube channel. Stephens explained that every year the Women of Marvel podcast has a theme. The theme in 2018 was “Allies.” This year, the theme is “Community,” taking inspiration from Captain Marvel and the Carol Corps and tying into the release of the Captain Marvel film. This is also the 80th anniversary of Marvel Comics #1 in 1939. Stephens is focusing today on how people break into the industry. “Back in the day, you went to a con and showed your portfolio,” but nowadays things are different, so Stephens asked each member of the panel to explain their breaking in story and how social media helped. Howard: “So I broke into comics in 2013 with a company called Top Cow. I submitted a script to one of their contests...they had said that they were saving a winter slot for women, so that gave me the confidence to try, and I won.” Howard added that having a published comic with her name on it was a major asset for getting further work, because she could show her published work to other publishers. “I think one of the great things about the internet is that we have like Goodreads and Tumblr,” sites where people can share things they like to read with other readers. Every company that has contacted Howard, she said, has said they liked something different about her work. “For those of us that are readers and creators and prefer to sit in our rooms and make stuff, we have a way to connect,” she said, discussing social media and forums. Eve Ewing was also well-known before she worked at Marvel. “There is some lore surrounding this,” Ewing said. A fan had commented, when it was announced that Ironheart creator Brian Michael Bendis was leaving Marvel, that Ewing should take the title and a petition ensued. “I’m [only] the fifth black woman to write for Marvel comics,” Ewing said. “That was as realistic as dreaming that I was gonna join NASA...I never saw that for myself.” Behind the scenes, Sana Amanat, Ta-Nehisi Coates, and Greg Pak advocated for her at Marvel. “I still had to pitch, I still had to get a lot of feedback, I still had to write scripts and get feedback on those, so I still had to do a lot of the normal things” Ewing said about her fame and the petition helping get her the position. A common theme for both Howard and Ewing is paying it forward, wanting to make space for more people like them to join the comics industry and to give them the opportunities she had. Jenny Frisson explained that she studied illustration in her undergrad, focusing on editorial illustration and hoping to design book covers. After finishing college, she realized that the books she really loved were comics, so she attended the Kubert School. The Kubert School focuses on sequential art, not cover art specifically, so she left after two years. She broke into the industry by meeting editors at conventions and showing her portfolio and sample packs. Witter has a degree in video game design, but moved on to making a webcomic which became popular. She also did a comic book adaptation of Anne Rice’s Interview With a Vampire. She joined the indy scene after attending C2E2 six years ago. She also began doing commissions, including some of Marvel characters, which eventually got her noticed by Marvel Editorial. She has done every cover of Doctor Aphra since issue 14, and has done every cover for X-23. Eve Ewing added that, in order to get hired by a company to do creative work, it’s important for any aspiring artist to stick to their own style, rather than trying to adapt to what they thing other people might want to see.